"The organizing power of the evolutionary paradigm... is paralleled by the organizing power of an Earth system perspective." Earth is a complex system of interacting physical, chemical and biological processes, and provides a natural laboratory whose experiments have been running since the beginning of time. The Earth system is often represented by interlinking and interacting "spheres" of processes and phenomena. The atmosphere, hydrosphere, biosphere and geosphere form the simplest collection, though some would add the cryosphere as a special element dealing with polar regions and processes, and others would add the anthroposphere emphasizing human dimensions and impact on the planet. The difficulty with any representation that divides the system is the danger of continuing a deconstructed perception of the holistic Earth system - in reality no part of the Earth system can be considered in isolation from any other part. 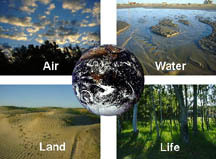 At the highest level, the four basic elements of the Earth system can be represented as air (atmosphere), water (hydrosphere), land (geosphere) and life (biosphere). Missing in this representation is the critical context within which the Earth system operates: the solar system and galaxy beyond (sometimes referred to as the exosphere), source of driving energy for the Earth (the Sun) and of critical external inputs such as asteroids and comets whose impacts have altered the Earth system significantly in the past. Earth system science embraces chemistry, physics, biology, mathematics and applied sciences in transcending disciplinary boundaries to treat the Earth as an integrated system and seeks a deeper understanding of the physical, chemical, biological and human interactions that determine the past, current and future states of the Earth. Earth system science provides a physical basis for understanding the world in which we live and upon which humankind seeks to achieve sustainability. 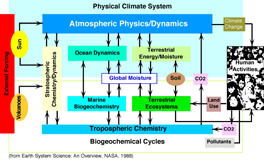 Earth system science builds upon the fundamental disciplines, which form the scientific integrating basis for any discussion of the system as a whole. This representation shows the critical relationship of ESS concepts as a bridge between the disciplines and the increasingly interpretive and integrative endeavors of human social processes. The future of our planet and the destiny of humankind are dependant upon this interdisciplinary pyramid of Earth system processes and phenomena. Given the concerns that humankind is impacting the Earth's physical climate system, a broader concept of Earth as a system is emerging, including societal dimensions and the recognition that humanity plays an ever increasing role in global change. Within this concept, knowledge from the traditional Earth science disciplines (geology, meteorology, oceanography, ecology, biology ...) is being gleaned and integrated to form a physical basis for Earth System Science. 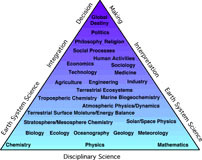 Earth system science fosters the synthesis of disciplinary knowledge into a holistic model of Earth with broader interdisciplinary relevance. However, the development both conceptually and physically of the Earth system model and its quantitative assessment in the classroom and laboratory is a continuing, formative processes which requires nurturing and commitment to eclectic learning beyond one's discipline. The intersection of disciplinary specialties often provides the most fertile and interesting fields for study, but is easily sidetracked by traditional disciplinary interests. In the mid-1980s NASA began a systems approach to cataloging the elements of the Earth system, their linkages, dependencies and fluxes. This simplified version focuses on the physical elements of the system, but relegates human processes to a simple box.